Back when I was used to having Hindi film songs play in the background all the time, names like Sahir Ludhianvi, Shailendra and Hasrat Jaipuri were well-known to me. Besides, with my father’s fondness for all things Raj Kapoor, it would have been impossible not to know his lyricist’s name. But while I appreciated the lyrics of songs even back then, even writing down specific lyrics in a notebook, I didn’t really pay much attention to the wordsmiths behind the words that captivated me. Back then, I recognised songs by the singers and the films in which they belonged. Music directors were seldom thought of, and lyricists were just names that were read out before the song was played on the radio. However, as I grew older and I really began to understand the craft of writing words set to a particular metre, and wondered at the ability to distill and emotion with such lyricism, I began to appreciate the lyricists more. I began the ‘Masters’ series as an attempt to throw a light on the artistes behind the screen. Among them were lyricists as well – Sahir Ludhianvi and Qamar Jalalabadi. Here, on what would have been his 96th birth anniversary is a worthy inductee to this category – lyricist Hasrat Jaipuri. Born Iqbal Hussain in 1922 in Jaipur, Rajasthan, ‘Hasrat Jaipuri’ was his ‘takhallus’ or nom-de-plume as a poet. Young Iqbal got his grounding in Urdu and Persian from his paternal grandfather, Fida Hussain. Coming to Bombay, he first began work as a bus conductor. Creative leanings aside, one had to live. During his 8-year-long career as a bus conductor, it was local mushairas that offered him an outlet for his poetry. Impressed with the poetry (titled Mazdoor ki laash) that he’d heard at one such mushaira, Prithviraj Kapoor introduced the young poet to his eldest son, who promptly signed him as the lyricist for Barsaat. Hasrat’s introduction to Raj Kapoor was the beginning of a beautiful friendship and a long-lasting professional relationship. Meanwhile, another poet had come to Raj Kapoor to offer his services as lyricist – Shailendra, whom Raj Kapoor had met earlier, also at a mushaira. Impressed with his poem, Jalta hai Punjab, RK had offered to buy the poem so he could use it in Aag. Shailendra had refused then, saying his poetry was not for sale, but circumstances forced him to approach RK for work when Barsaat was being filmed. Now there were two debutant lyricists on board as well as a debutant music director duo who began their career with the same film – Shankar-Jaikishan. Thus was Raj Kapoor’s dream team formed. Together, the foursome would go on to create magic. 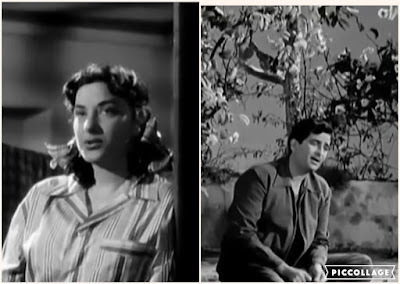 Hasrat Jaipuri’s very first lyrics were written for Jiya beqarar hai, scored by Shankar. 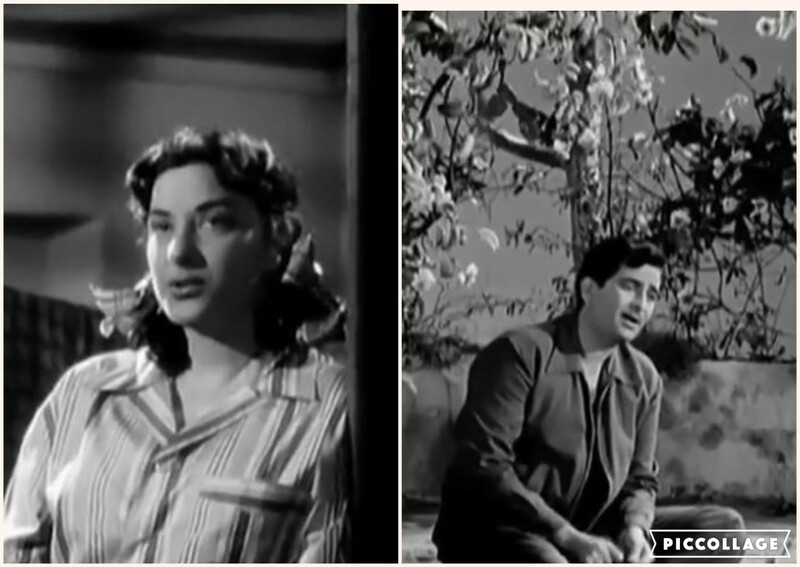 (The melody, incidentally, that caused the falling out between Raj Kapoor and Ram Ganguly.) Then, he wrote ‘Chhod gaye baalam’ for Jaikishan, for the same film. Interestingly, from now on, Shailendra would mostly write for Shankar while Hasrat worked with Jaikishan, though of course, this was not an exclusive arrangement. Hasrat soon became known for his romantic songs; he unabashedly admitted that he was a romantic at heart, having penned ‘Ye mera prem patr padhkar’ to a neighbor in Jaipur because he was too shy to express his feelings verbally. That song would eventually be sung to another Radha – Vyjayanthimala in Sangam. In an interview with Lehren TV, he confessed that as a bus conductor, he allowed beautiful girls to travel free on his route, because their beauty inspired him to write poems. Yet there was more to Hasrat Jaipuri than airy romantic melodies. While he’s not as famous as Sahir is, for instance, for his ghazals, Hasrat Jaipuri wrote quite a few ghazals himself, and in fact, published a few books on ghazals. Here I present a selection of some of my favourite Hasrat Jaipuri songs. Because the bulk of his work was for Shankar-Jaikishan, I have divided the list into two parts – the first set being exclusively SJ compositions, while the second part consists of his work for different music directors. It’s a gentle warning, but as he continues he asks his beloved how he can bid her goodbye; he doesn’t trust anyone, he says, and begs her to hide because the sight of her is enough to lead God astray. This is probably one of the finest Hemant-Lata duets in Hindi films – there’s an ephemeral feeling to both lyrics and picturisation. It’s a song of second chances – she has a past, he’s accepting of it. Their love has seen many trials and tribulations, but their present happiness is so much more important for the sadness that went before. That quiet acceptance, that mature outlook is reflected in the lyrics as well - he’s thinking of her and wondering where she is. And she responds, she is right here, wherever, whenever he calls for her. Hasrat Jaipuri wrote the lyrics for six of the ten songs in his debut film. While Jiya beqaraar hai and Hawa mein udta jaaye (penned by Ramesh Shastri) may be more well-known, this one holds a special place in my heart. The initial part of the song is an expression of love, of her nascent feelings towards this stranger who has made a place for himself in her heart. Hasrat’s expressive words brought out both emotions beautifully. A song of conflict of dreams that have soared and crashed, of relationships that have been sundered, of regrets for past sings, of the dilemma of how to move forward… Hasrat Jaipuri’s pathos-laden verses captured every single one of these feelings. His words evoke a feeling of sympathy in the listener – how can one not forgive somebody who so eloquently voices his regret? Indeed, where does one go from here? Sapne jagaake tu-ne kaahe ko de di judaaii? This might be something that Hirabai might ask God, herself. This is one of the few instances when Madan Mohan moved from his usual lyricists Raja Mehdi Ali Khan and Rajinder Krishan. Hasrat proved that Madan Mohan hadn’t made a mistake with his romantic, sensual lines for this song which, in context, is also incredibly poignant. The song, sung by a newly-wedded couple, is being overheard by another husband and wife – a husband who wonders why his wife is so distant, and a wife who is unable to tell him the reason. While the singers express their love and passion in verse, the other couple – watching separately – are torn, both by the love and desire evoked in them by the song, and by his sense of rejection and her turmoil in keeping a dangerous secret. 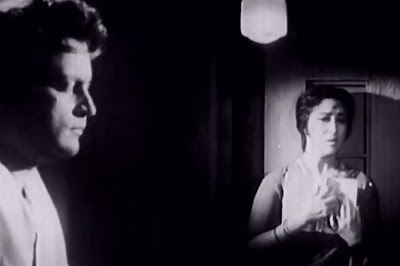 In yet another version of ‘The Taming of the Shrew’, the hero (Joy Mukherjee) saves the heroine’s (Asha Parekh) life (she’s ridden off on an untamed horse, and he manages to grab her before she breaks her neck) and then, acting upon orders received, deposits her in her room and locks her in. He then proceeds to a village fete to enjoy a night of dancing. What he doesn’t know is that our intrepid heroine has a pet elephant, and she manages to escape by the simple expedient of jumping on to its back from her balcony. So it’s a bit of a surprise to see her dancing on stage. Surprise turns into shock when she literally challenges him to outwit her. In verse. A man in love has to think of many ways to extricate his beloved from the company of other people. And if it is her parents who are chaperoning her, then it’s even more necessary. Sulekh (Nutan) wants to climb to the top of the Qutb Minar and, since her parents are too old to climb all those flights of stairs, Rakesh (Dev) gallantly offers to be her guide. On the way up, he attempts to tell her of his feelings, but she refuses to listen. “Listen to the sounds of silence,” she tells him, and is abashed. On the way down, however, he insists that she listen to the buzz of his beating heart. Obviously, she’s not immune to his charms, but by the end of the song, she’s not even making a token resistance. And she sings of her helplessness, and His obliviousness to her plight. In the same film, Hasrat wrote also about the wonder that is love in Muhobbat aisi dhadkan hai; I had a hard time choosing between the two. Another woman, another love song about the flush of new love. Hasrat Jaipuri was one of three lyricists on this film (the others were DH Madhok and Rajinder Kishan), and he wrote the lyrics for just one song – Khayalon mein tum ho. Here too, the lyrics speak of the difficulty of being in love but to this woman, in this context, her conflict is beautiful. RD Burman had made his debut as an independent music director with Mehmood’s Chhote Nawab (1962). Three years later, he would not only score the music for yet another Mehmood venture, but also act in it. This song, picturised as a cultural competition, has a very young and very pretty Tanuja on stage. (You may notice another famous personality in the frame – a very young radio host Ameen Sayani of Binaca Geetmala fame. He even sounds like Pyarelal from Chupke Chupke . )Here is another song that expresses the conflicting feelings when one is in love. I love the simplicity of the lyrics as well the sweetness with which Lata sings this song. While the assumption was that it was Shailendra who wrote in shudh Hindustani, and Hasrat Jaipuri typically wrote in Urdu, the latter could write in simple Hindi as well as any other lyricist. Here’s an example of how simple rustic lyrics in a dialect work just as well as any other poetic flights of fancy. This is once again a love song, with the woman expressing her shyness at her beloved’s gaze. The lyrics of the song are no less captivating for their simplicity. * I haven't been able to find the original source for this photograph. If anyone knows, and can let me know, I'll make sure to add the credit.